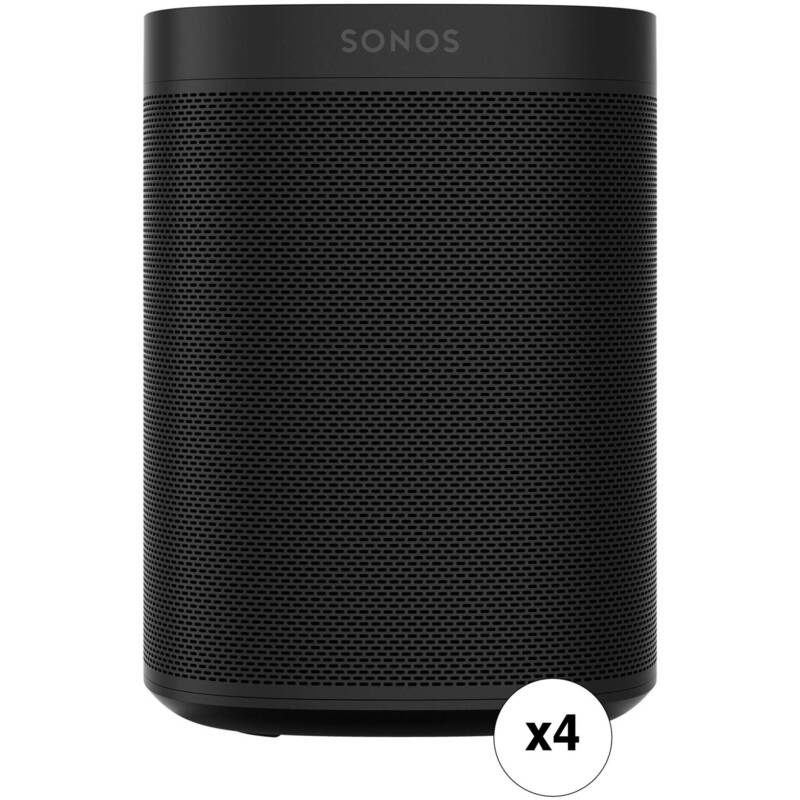 Set up a multi-room music system with this B&H Kit of four black Gen 2 Sonos One Speakers. They will connect to your home network via Ethernet or built-in Wi-Fi to stream music from thousands of free Internet Radio stations or from virtually any online music service. Connect two of the Sonos Ones to a PLAYBAR or PLAYBASE for surround sound. With Alexa functionality built-in, you can use far-field voice technology to ask Alexa to check the weather and traffic, hear sports scores, play your music, and more. Note: Certain Alexa- and location-based features will have limited functionality outside the US. The 2nd generation Sonos One does not support Alexa voice calling. Please see the manufacturer's website for more information. Content acquired via certain apps may require subscription to a service. With integrated wireless connectivity, voice control, and home automation support, the 2nd generation black Sonos One isn't your typical wireless speaker. Equipped with Wi-Fi and an onboard microphone system, the Sonos One connects to your home's wireless network and allows you to intuitively play music, check the weather and traffic, hear sports scores, and more. Using far-field voice control technology powered by Alexa, the built-in microphones allow the Sonos One to pick up your voice from any direction in the room, even while music is playing. The Sonos One allows you to start and control your music with your voice with Amazon Alexa built-in. Use just your voice for hands-free control of your music and more. You can also control the speaker via the Sonos app, AirPlay, or your favorite music service's app. Play songs, check news and traffic, manage smart devices, and enjoy all the helpful Amazon Alexa skills using the Sonos One. The compact construction of the Sonos One makes it versatile enough to fit in areas where space is at a premium. The Sonos One is part of the Sonos ecosystem, allowing you to add more speakers to fill every room with sound. The Sonos One is powered by a pair of Class-D amplifiers, which are tuned to match the drivers and acoustic architecture to help provide rich, room-filling sound. The tweeter is designed to create a crisp and clear high-frequency response, while the mid-woofer is engineered to provide mid-range vocal frequencies and deep bass. Customize your sound in one room or groups of rooms with additional speakers. The microphone array of the Sonos One is used for smart voice capture and features noise cancellation. Alexa provides an audio chime to let you know that the Sonos One heard you and is working on a response. An Ethernet port is onboard in case your Wi-Fi signal is weak or unstable. An illuminated LED indicator light lets you know when your speaker's microphone is active or turned off. Use the touch controls to adjust the volume, skip to the previous or next track, pause or resume playback, or mute the microphone. The LED indicates status, mute status, and voice feedback. Pair two Sonos Ones together in the same room for stereo sound, add a Sub for augmented bass, or pair with your display's Beam, Playbar, or Playbase for wireless home theater surround sound. Designed to resist humidity, the Sonos One can stream your favorite songs in music-starved places like bathrooms and outdoor patios. All you need is Wi-Fi and a power source. Trueplay fine-tunes the Sonos One to help ensure that you get enhanced sound quality in nearly any room. Sonos speakers play a variety of popular streaming services, on-demand internet radio, podcasts, audiobooks, and your collection of downloads. Download the Amazon Alexa app and either sign in or create a free account. Download the Sonos app, then connect your Sonos One to power. Follow the setup instructions in the Sonos app, then sit back and listen. During the initial setup, Bluetooth BLE is used to temporarily communicate with your compatible smart device. Box Dimensions (LxWxH) 9.9 x 6.8 x 6.8"